Fallout is sort of anchored in that retrofuturist 1950s post-war culture thing and I can't think of a single thing that represents that culture more than the humble black and white television. 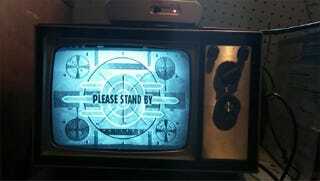 Therefore playing a game like Fallout: New Vegas on an ancient, still-functioning black and white CRT TV? That seems like a perfect fusion. I just love this series of pics posted on Reddit. A couple of friends managed to find a working TV, a TV that just instantly screams 1950s. To be honest, it just screams Fallout so the pair decided to play Fallout: New Vegas on it. The results are as good as you might expect. Sure, you lose a bit of impact, but the atmosphere. This incredible atmosphere. I really want to do this. Old TVs are the best. This post originally appeared on Kotaku Australia , where Mark Serrels is the Editor. You can follow him on Twitter if you're into that sort of thing.